Pluto on Pluto – What are the Chances? On the left is the first picture of Pluto unveilled by NASA… Is it just me or does anyone else find the silhouette of Walt Disney’s Pluto’s head on it uncanny? 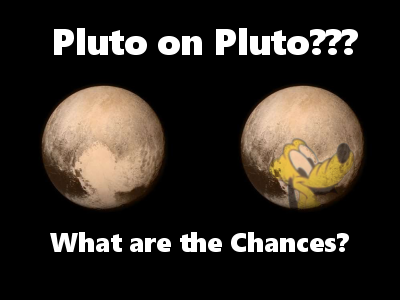 I’ve superimposed Disney’s Pluto’s head on the right in case anyone doesn’t see it! This entry was posted in Memes on July 16, 2015 by Cian Foley.